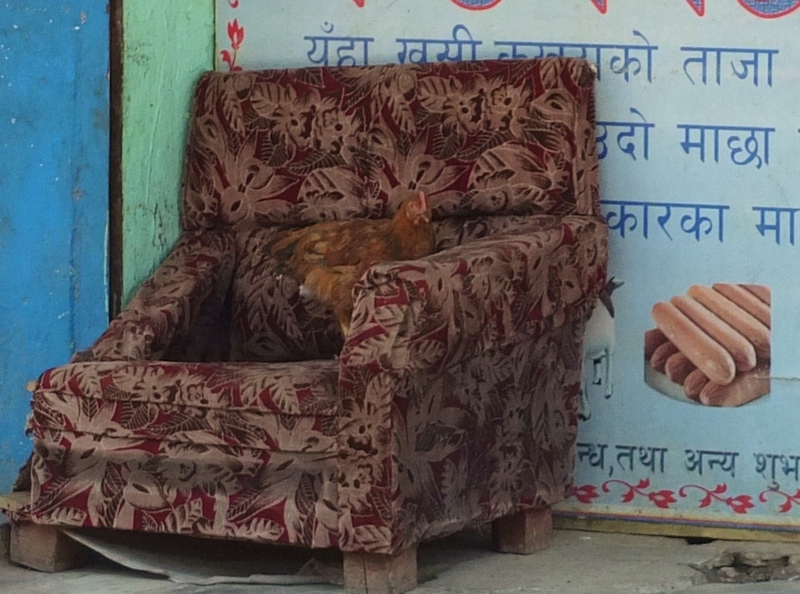 Chicken in Armchair with Sausages…. Honey, did the earth move for you? Large aftershocks trigger their own aftershocks, sometimes leaving you with the sickening feeling that this will never end. Feeling after quakes all the time. 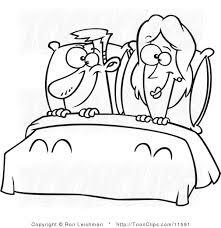 Everyone says, “Was that me?” ( or was that really a quake?) Sometimes I’ve felt it, sometimes not. And I do it too. For my own sanity, I keep a bottle of water at eye level on the windowsill next to my desk. I’ve become super sensitive to the noises and rumblings of the building. I can feel and hear when pumps or AC motors turn on, and my eye automatically checks the water for movement. The noise. 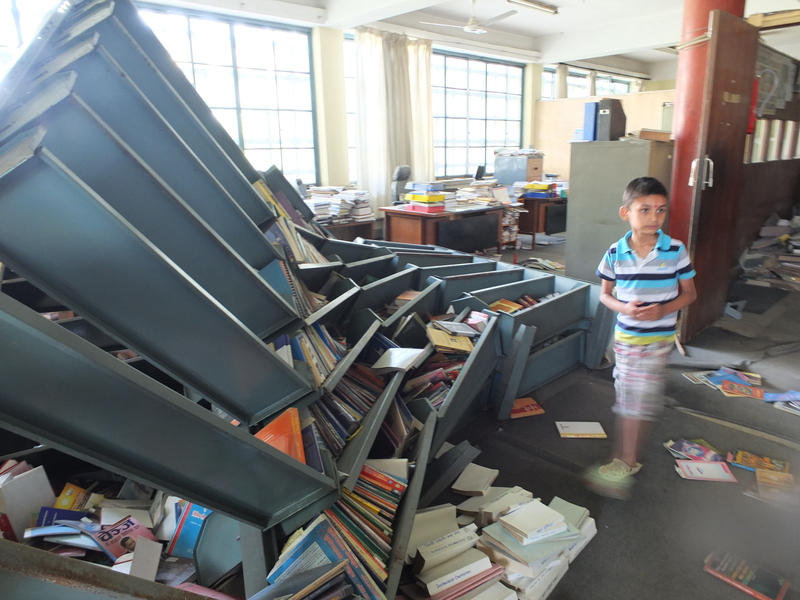 When I think back to the major quake, I don’t remember any noise except the thud of my own heart and other people screaming. But there is a noise that comes with the quake. Some people say they hear a train coming, I hear rumbling and a bang. 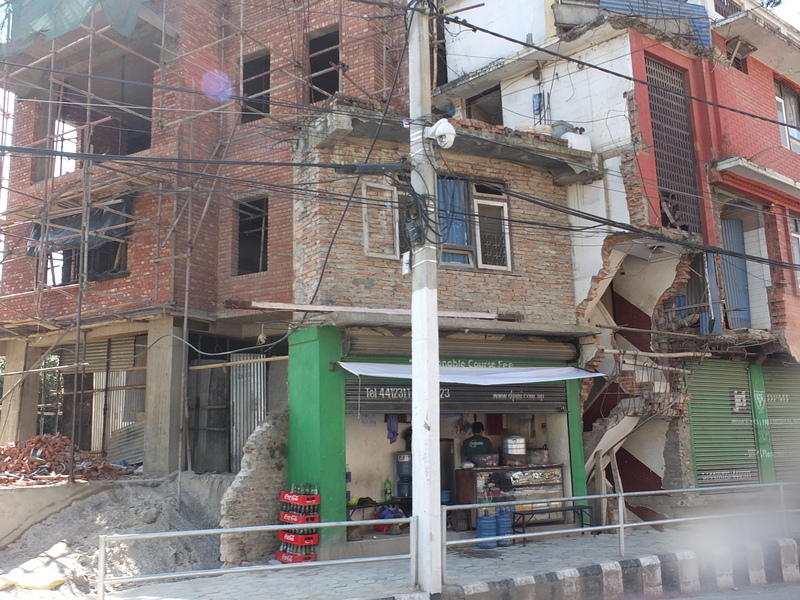 Here in the middle of noisy Kathmandu there are plenty of unexpectedly slamming windows, rumbling trucks, or generators clunking back on that set of an alarm in my head. I don’t run screaming from the building, but the hairs stand up on my arms. The fear of other people. I don’t like going out in public much at the moment. I go, but now I particularly avoid being around too many people. At the slightest tremor, they panic and scream, and waves of hysteria really don’t help. I don’t need to add being trampled to death to the list of dangers. Birds. A lot of the CCTV and tourist video captures the sudden flight of birds that take off seconds before we feel the quake. 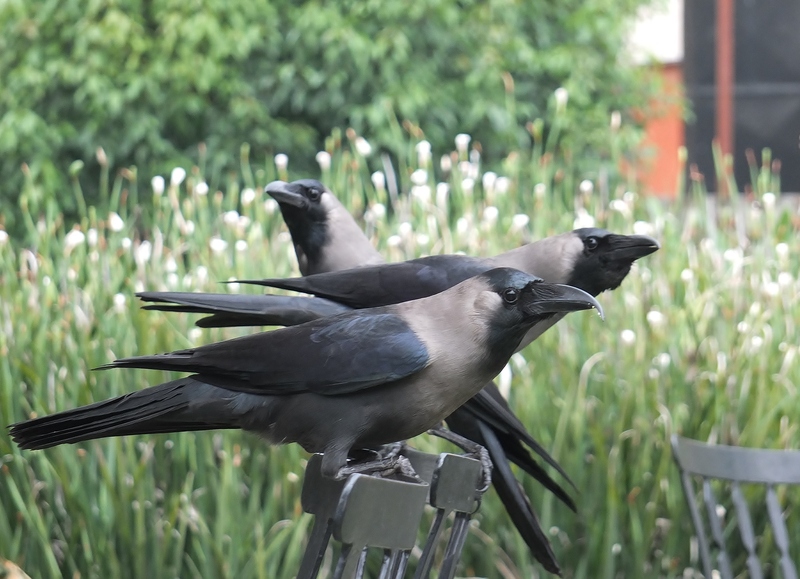 They sense it before we do and startled crows are now another way to make you twitch. Is it safe? A year ago we went to a movie on the 7th floor of a Kathmandu shopping mall. After, as we left, the city power went out and the generator took way too long to turn on. We stumbled around in a dark passageway that was blocked with boxes and trash. It felt like the most unsafe building in the city and we never went back. 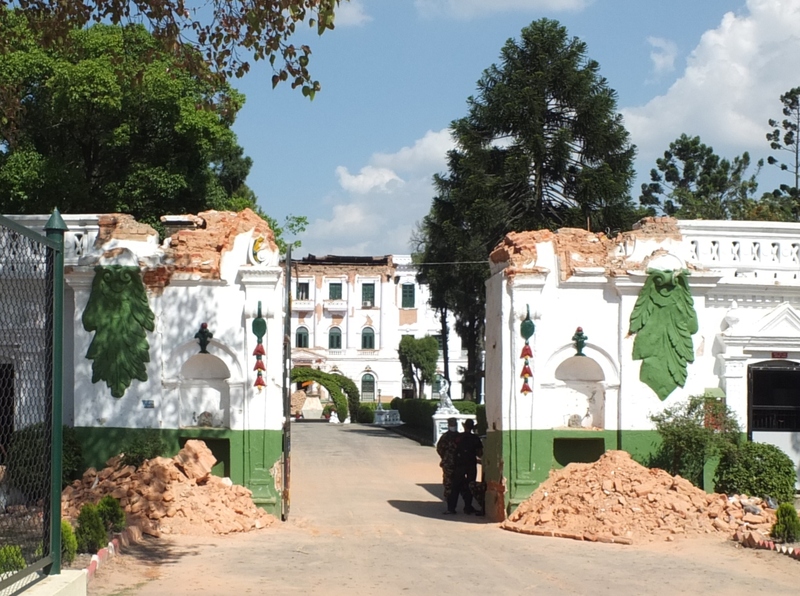 Apart from this incident, we’ve felt pretty safe exploring the city, enjoyed historic temples and the old Rana palaces that are now libraries and restaurants. Before, an assessment was based on whether a place would have decent service or not make us sick. Now I’m checking it for cracks and an exit strategy. Exhaustion. We work, function, cook, garden, shower and mostly carry on as normal but are completely spent by 8pm. I don’t understand why I’m exhausted as though I’ve been carrying bricks all day… until I remember the disturbed sleep and the weight of all the stresses above – then it sort of makes sense. A little dark for this particular challenge, maybe? 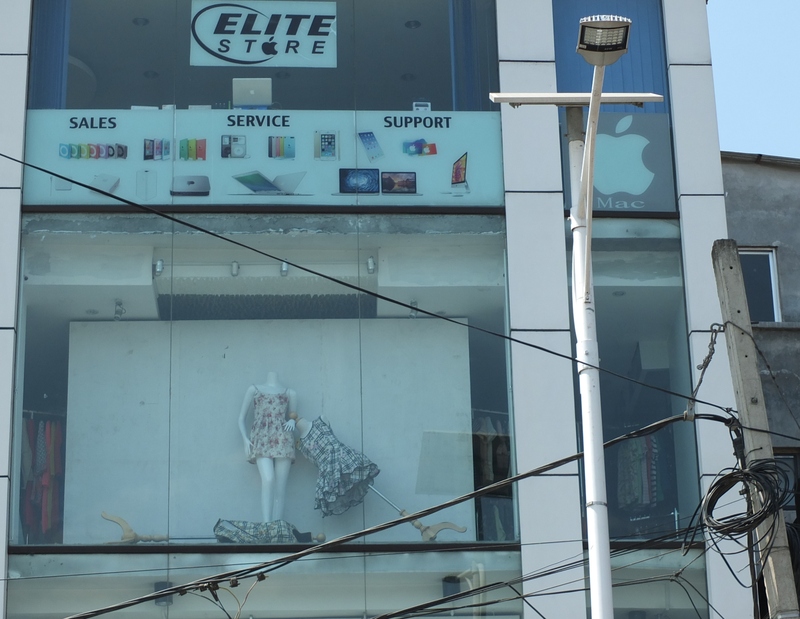 But where else am I going to share the odd side of Kathmandu’s recent earthquake? Tragedy was everywhere and now comes resilience and rebuilding, but there is a little strangeness also, still lingering in the corners. Little reminders of what happened even after most of the debris has been picked up: a vase of flowers still standing inside a room seen through the gaping side of a building; billboards advertising events that were clearly cancelled; a paint store with its roll-down shutter still closed and paint oozing out onto the street…and these mannequins, who tell their own story. 60 days until our departure from Kathmandu. An earthquake was nowhere on my schedule – nor anyone else’s. But it came and changed everything – some of it forever. There was so much saturation coverage on the news, and now it slowly becoming a secondary story…but the humanitarian recovery effort here is only just starting. We are still recovering. We are ok. We’ve caught up on sleep and the are over at least the first waves of shock and disbelief. Amazingly everyone at work is ok too, many families and homes —-not so much. I was up a high A-frame ladder when it struck. The ladder shook but didn’t fall, but I couldn’t get off it either. I was surrounded by 7ft tall very high library book cases which carpenters had just put together for a new library I’m opening. The metal cases are so heavy it takes 6 guys to move them and they were swaying next to me. Eventually, I managed to get down, but by now I was the last one out and the floor was rocking so hard I couldn’t walk. So I crawled out. Once I got out the building, everything was still shaking and all I could do was run uphill, across the shaking car park to the metal bars of the fence. 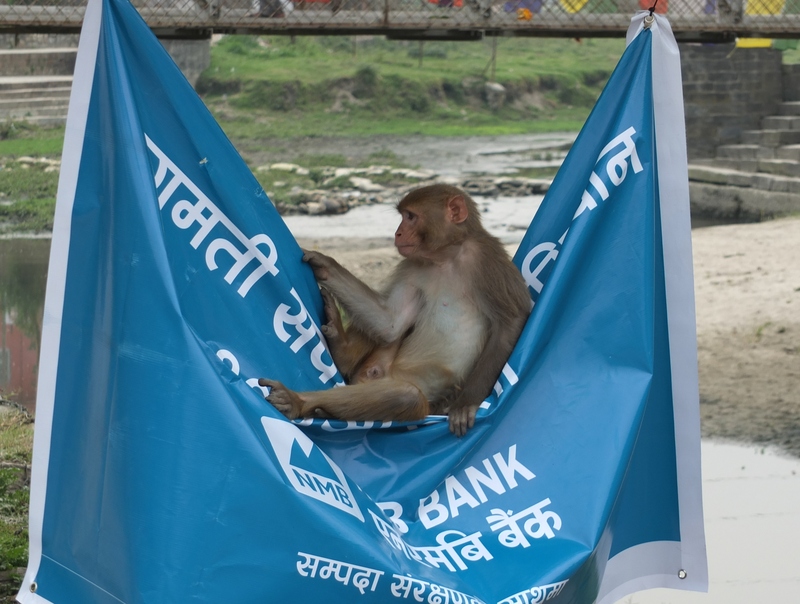 We held on tight until the shaking stopped and then ran down the to the Bagmati River away from buildings. There was already about 100 stunned and frightened people down there, hopelessly trying to take in what just happened. 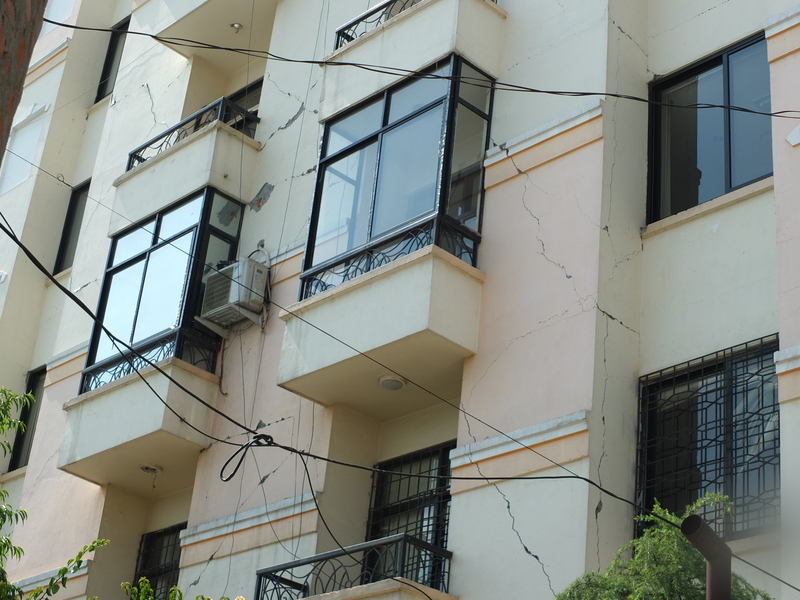 Around me were tall buildings with giant, scary cracks in them, and it started to sink in just how badly the earthquake had hit. Suraj, the project engineer, had a car and said he would drive me home. So we started driving through groups of stunned people and piles of bricks from fallen walls. 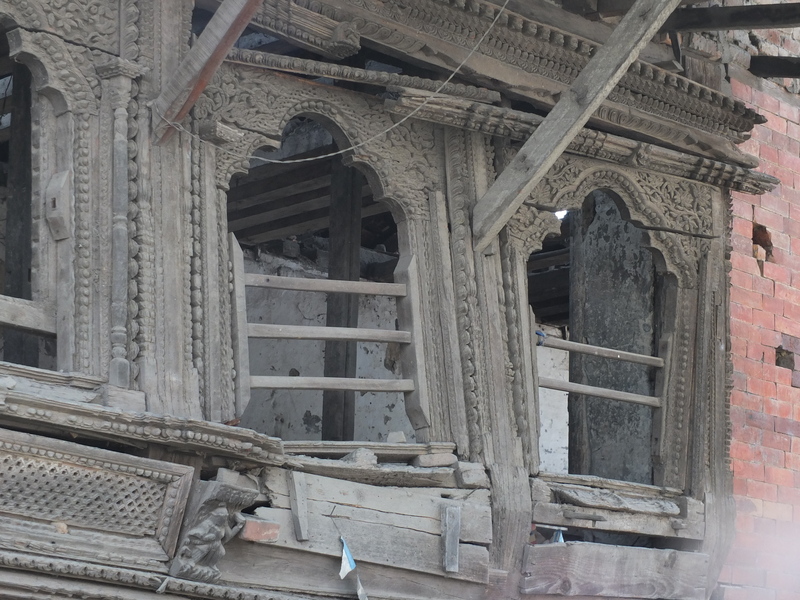 Once we got on to the main roads, we started to see fallen buildings, fallen ancient temples and wide cracks in the road. Some roadways were blocked and we had to drive the long way around, all the time with the hand of the horn. Cell phone service was down but I could get Robert with texts. I kept texting, telling him where I was at various landmarks, in case something happened. About half way home the ground started shaking and Suraj yelled “get out the car” and we just stopped in the middle of the road and ran. 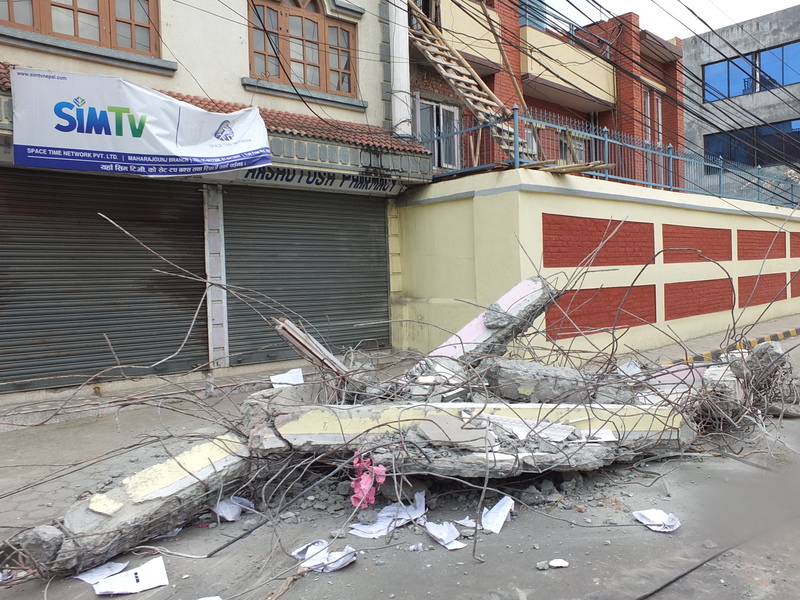 This was the second 6.something tremor and I looked around for something to dive under, but in Kathmandu there’s nothing safe. We stood in a random car park, as far away as we could from the surrounding buildings, and watched electric cables and a tall glass building sway opposite. It was then that I was the most terrified. Dying seemed like a real possibility. When it stopped and we calmed down, we continued driving. When the next tremor came we were near a park, and stopped the car and ran into the open area. This was the safest spot we had found and stayed there, along with hundreds of other people. 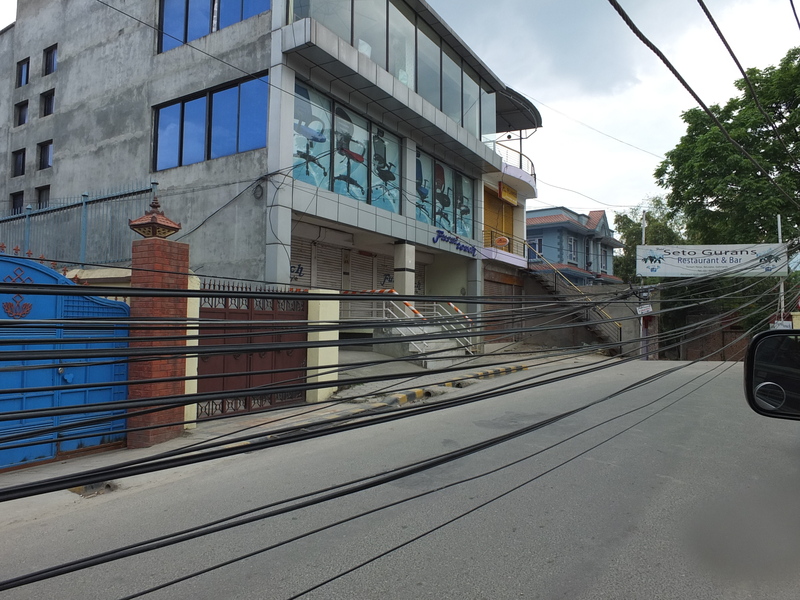 Its only about 10 minutes walk from home, but the tremors kept on coming and the thought of walking between cracked buildings and swaying electric poles made it too frightening to move. I sat in the park for about four hours with support from families I knew. No water, no toilets. We just sat there and all froze every time the ground rumbled—which was frighteningly often. The aftershocks just kept coming, again and again. Eventually, the need to be home outweighed the fear of the next quake, so I walked home. My area of town had less damage, as most of the buildings are newer and better built. Our house was fine, except for some buckling of the cement driveway and some cracked exterior pillars. We lost a few personal possessions like glass dishes, photos frames and plants, which all made a huge mess but, in the big picture, they were nothing. Robert had been home alone for all it. The house had rocked and lurched badly, to the point that he thought it was sliding down a sink hole. Getting back into the house with the two-way radio and supplies was a totally different world. That evening we headed to the Embassy to sleep on Robert’s office floor because of the danger of afterquakes. The Embassy is built to very high earthquake specifications, so even though it rocked badly with each after tremor, I felt so much safer. We spent a second night there and have been taking in American citizens, Peace Corps volunteers and others who are camped outside in the Embassy grounds (if they have tents) or sleeping on the cafeteria floor, plus lots of kids, babies and dogs. We were lucky enough to be able to go home to eat and shower, and are now back home to stay. Just basic humanitarian relief will take weeks. 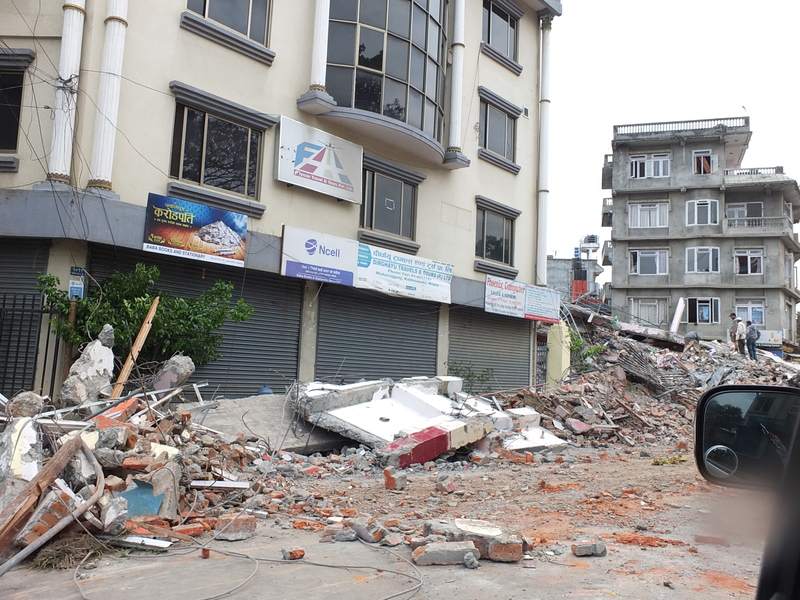 Although Kathmandu has taken a bad hit, there are more standing/undamaged buildings than expected and in some areas of town its not so noticeable. The city is slowly coming back to a very slow version of normal. 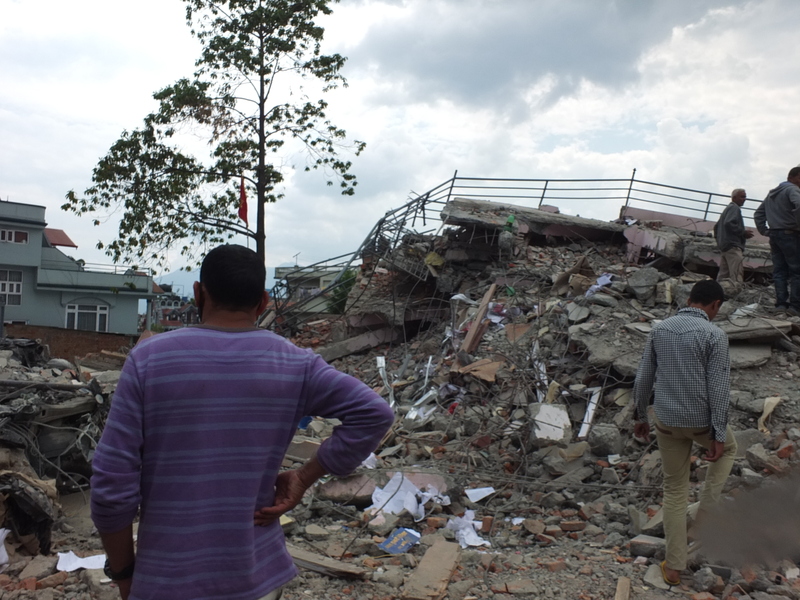 Outside Kathmandu it is a very different story, and the villages are full of simple brick houses which certainly have collapsed, so the full story of the death toll will take a long time to compile. We are all just so exhausted. Its going to be a very different ,very weird last 60 days.